On Wednesday afternoon I spent an hour chatting with Rachel Aldred at the University of Westminster. You might know Rachel from the likes of the Cycling Cultures research project, or from the London Cycling Campaign policy committee, for which she has just taken the chair, or from her blog. We talked about the importance of researching cycling, Cycling Cultures, the “Get Britain Cycling” parliamentary inquiry, including what the barriers to cycling in Britain are and the infrastructural and systemic changes that are required to enable cycling, and about Rachel’s latest research into the uses and abuses of transport modelling. We also chatted about cycling campaigning: her research into it, and the great effect that the internet is having on it, plus her own work for the LCC. Among other things, the ‘uhms’ and ‘ahs’ and ‘oh, no, lets do that bit agains’ and ‘who would have guessed radio could be difficult?s’ have been cut out, leaving eight minutes to be included in The Pod Delusion, broadcast in London at 11am tomorrow (Sunday) on Resonance 104.4, or else podcasted here. A longer half-hour cut which includes the campaigning chat should also be made available to download there, or here, or somewhere, at some point. I fear eight minutes chat might not have been enough to discuss the entirety a topic that deserves to have a book written about it (agents and publishers can contact me on the email address in the about page if they’re looking for suggestions for the person to write it), and that we were perhaps talking a little too much to our already well-versed blog audiences rather than the general Pod Delusion audience. But if you liked it, I might consider leaving the comfort of the word processor behind again in the future. That’s if I can find a way to get over that whole horror of hearing how your own voice really sounds thing. Cycling clearly has an image problem in large parts of the English-speaking world. It’s for the sporty obsessives, or it’s for the poor, or the drunks who aren’t allowed to drive any more. Outside of the biggest and densest cities, driving is normal and cycling is abnormal, and people don’t want to be abnormal — a point reinforced by the latest output of the Understanding Walking and Cycling project. I’m sure that our frequent commenter friend Pail will find much to nod along to in the UW+C work — and much to shake his head to where the same researchers point to the need for bicycle infrastructure. British cyclists of course know about cycling’s image problem — they encounter and experience it. They know of its geographical and demographic variation, and that cycling’s image has a clear relationship with cycling rates and infrastructure provision. Cycling’s image problem is not unrelated to the fact that bicycle users have been treated as third-class citizens in the provision of infrastructure. Providing infrastructure might not be the only intervention that is required to build mass everyday cycling, but it is the key one — the key stone or firm foundation without which everything else collapses. “Promoting” and “encouraging” cycling, trying to fix its image problem, trying to break any of the other barriers to cycling, will achieve little so long as we are asking people to ride in such hostile and uninviting environments. Thinking about how the Cycling Embassy might go about trying to generate political will to progress cycling, I’ve been researching previous failed attempts to advance cycling in this country. 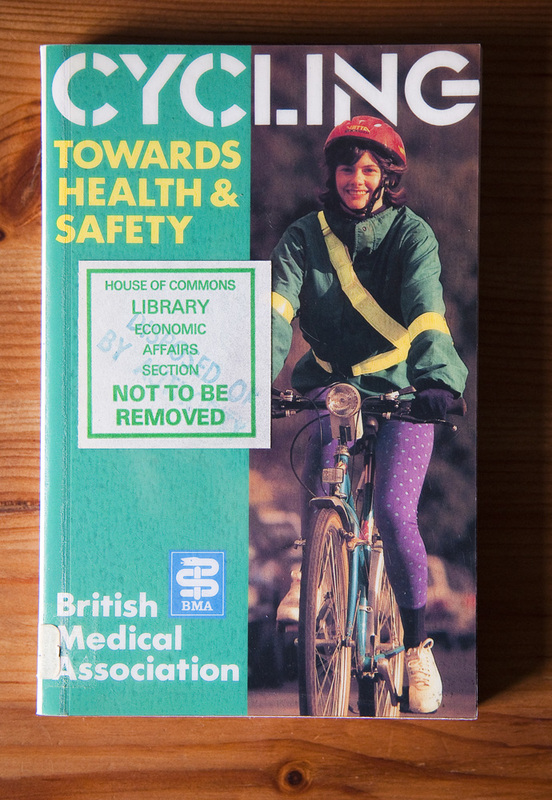 So on Amazon I snapped up a second-hand copy of an out-of-print British Medical Association book written in 1992: Cycling: towards health and safety. People in Public Health are very interested in the bicycle because it keeps you fit — thus reducing incidence of obesity, cardiovascular disease, cancer, diabetes, dementia, depression, etc, etc — in a way that can be effortlessly integrated into everyday routines. And because it provides an alternative to transport modes that cause thousands of hideous traumatic deaths and injuries, even more air pollution-related deaths, isolation-related mental ill-health, and so on. 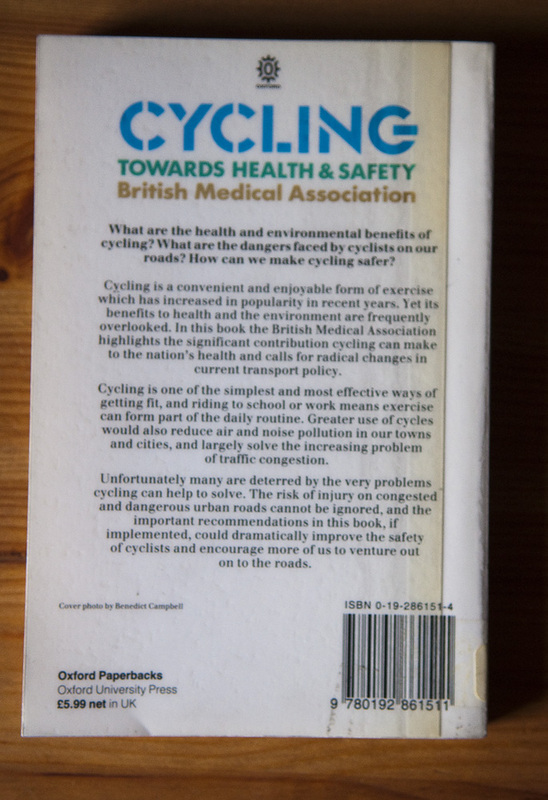 From a quick flick through, I’m expecting all that to be covered, in addition to a section on “barriers to cycling” which looks like it might cause a cardiovascular event itself by chatting about the weather while ignoring the elephant in the room. But also when I quickly flicked through, I noticed I was breaking the spine. This second-hand book has never been read, never been opened except to stamp “date of cataloguing 14 May 1992” and “disposed of by authority” on the inside cover. Where does this never-before-read book make its way to me from?